Compass Airlines ("Compass Mk. I") was a low-cost airline created in 1990. It only operated from December 1990 to December 1991 and ceased due to financial difficulties. The name was continued by Southern Cross Airlines, which acquired Compass Holdings. This airline, known as "Compass Mk. II", used MD-82s and MD-83s (as opposed to the Airbus A-300s of "Compass Mk. 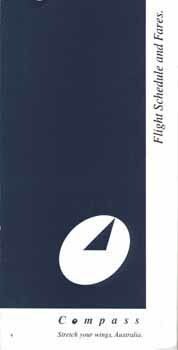 I"), but lasted an even shorter time, from August 1992 to March 1993.
visit the Compass Airlines page of Perry Sloan's "AirTimes" site. This page last updated March 4, 2017.